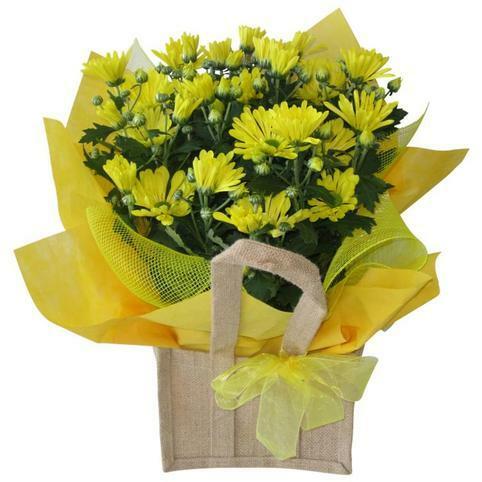 Fresh and popular flowering chrysanthemum plant. 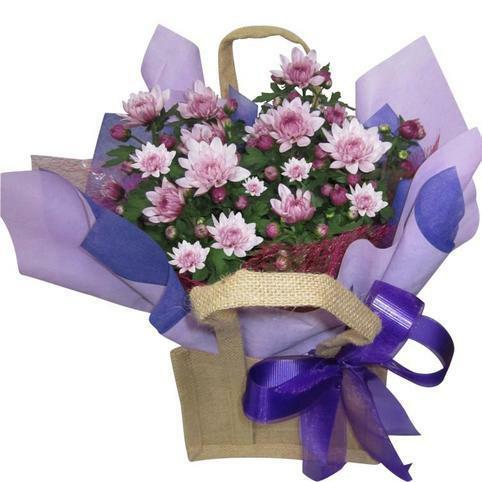 Our florist will choose a lovely flowering plant, based on seasonal availability. A great gift option to send to hospitals. Your pot plant will be beautifully gift wrapped finished & dressed with a jute bag & ribbons. The chrysanthemum plants come in a mixed box of colours and the colour may vary from the pictures shown. Water often and always keep the soil moist. Bright light but not direct sunlight. These plants are very good at removing toxins from the air as they have a very high transpiration rate. A chrysanthemum will flower for approximately 6 - 8 weeks after which you can cut back and plant in the garden. We get our plants fresh from the grower on a weekly basis, so we always have a high turnover of lovely fresh plants in stock. Free Plant Delivery in Auckland!